1. Paving Monongahela Boulevard, Morgantown, W. Va. 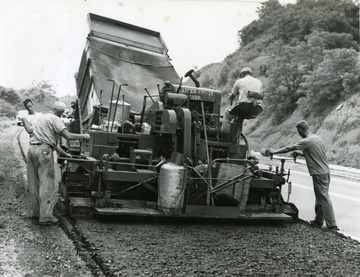 Paving Monongahela Boulevard, Morgantown, W. Va.
Workers seen paving Monongahela Boulevard in Morgantown, W. Va. Dump truck laying asphalt as spreader follows behind evening out pavement. 2. 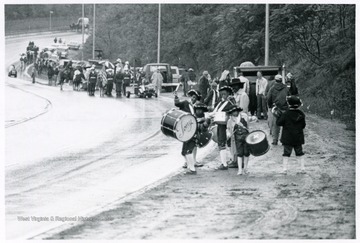 Monongalia County Bicentennial Parade, Morgantown, W. Va.
Monongalia County Bicentennial Parade, Morgantown, W. Va.
Colonial drum corp and other participants lining up on Monongahela Boulevard for the Monongalia County Bicentennial Parade. 3. Monongalia County Bicentennial Parade, Morgantown, W. Va.
Cars and parade groups coming down Monongahela Boulevard. 4. 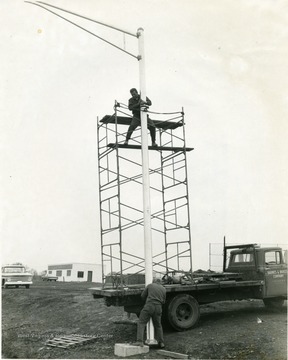 Installing Traffic Lights, Morgantown, W. Va. 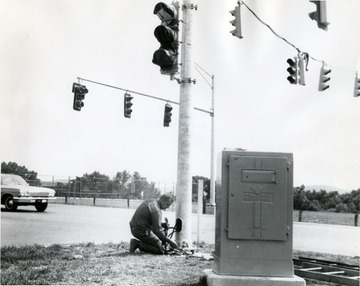 Installing Traffic Lights, Morgantown, W. Va. 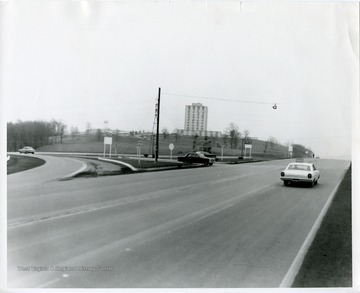 Installing traffic lights at the intersection of Patteson Drive and Monongahela Boulevard. 5. Accident at the Intersection of Patteson Drive and Monongahela Boulevard, Morgantown, W. Va. Accident at the Intersection of Patteson Drive and Monongahela Boulevard, Morgantown, W. Va.
A car smashed in a car wreck is being towed away on the corner of Patteson Drive and the Boulevard before the lights. 6. 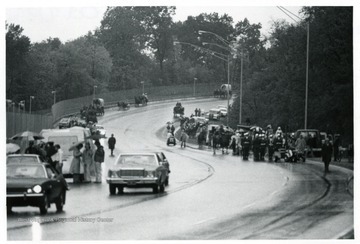 Intersection of Monongahela Boulevard and Patteson Drive, Morgantown, W. Va.
Intersection of Monongahela Boulevard and Patteson Drive, Morgantown, W. Va.
Several cars are stopped at the intersection of Monongahela Boulevard and Patteson Drive in Morgantown, West Virginia. 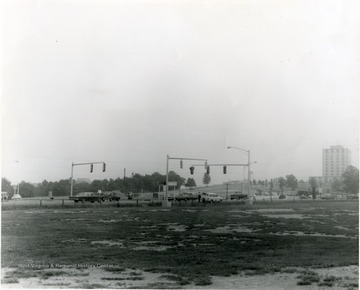 Street lights at the intersection of Monongahela Boulevard and Patteson Drive. 8. 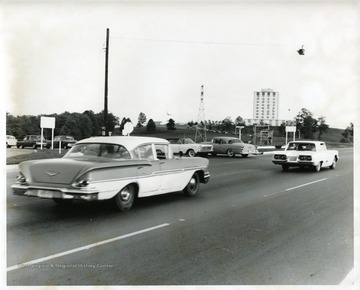 Intersection of Monongahela Boulevard and Patteson Drive, Morgantown, W. Va.
Several cars are stopped at the light at the intersection of Monongahela Boulevard and Patteson Drive in Morgantown, West Virginia. 9. 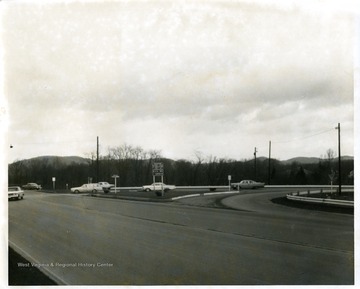 Intersection of Monongahela Boulevard and Patteson Drive, Morgantown, W. Va.
Cars at the intersection of Monongahela Boulevard and Patteson Drive in Morgantown, West Virginia. Installing street lights at the intersection of Patteson Drive and Monongahela Boulevard. 11. Monongahela Boulevard, Morgantown, W. Va.
Monongahela Boulevard, Morgantown, W. Va.
A view of Monongahela Boulevard. Three men appear to be chopping wood to the right. 12. 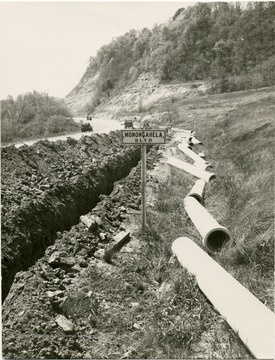 Laying Pipe on Monongahela Boulevard, Morgantown, W. Va. 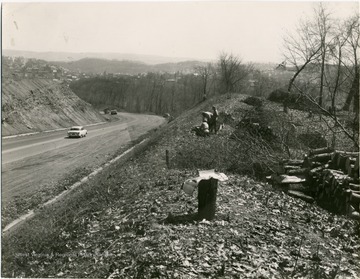 Laying Pipe on Monongahela Boulevard, Morgantown, W. Va.